You’ve done your research and have invested in an LTS security system inside your business — there are, after all, many benefits of video surveillance systems. Have you thought much about a business security camera for your parking lot though? By installing business security measures in your parking lot, you can decrease theft and increase safety for your Moreno Valley business even more. Here at Dutale Inc., we update our blog regularly with tips and tricks about VoIP solutions and business security, such as how to reduce inventory shrink or discussing the pros and cons of business security cameras. We hope you use all of this as a resource as you consider, research, and ultimately invest in business security. 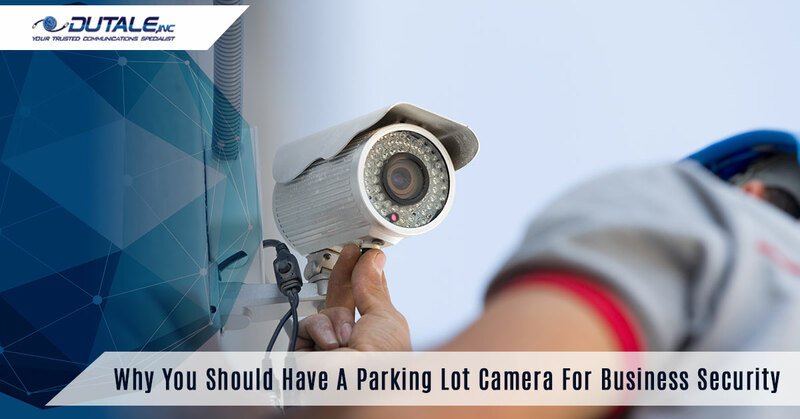 In today’s blog, we’ll discuss just how a parking lot camera can benefit your Moreno Valley business. Often overlooked, a parking lot camera can actually benefit your business in many ways. If you’re interested in taking your business security to the next level, contact Dutale Inc. for a free quote today! Whether it’s your vehicle, an employee’s, or a client’s, having footage from a business security camera could prove extremely useful after a hit-and-run accident in your parking lot. If you have a video camera security system in place that is well-positioned and can recognize license plates, then you could save yourself (or another person) a lot of money and stress — while also getting a dangerous driver off the road. Would-be thieves are much less likely to break into your establishment if they see business security cameras in the parking lot. This will make them think that you are also protected inside your business and it leads to even more opportunity for them to be caught. If the person were still to break into your Moreno Valley business, then you would have evidence from your cameras to find them and press charges. It’s important that your parking lot cameras also provides a view of the walkway(s) to your business. This will document any accidents that may occur on your property — and provide you with evidence in the event of a lawsuit. You do, of course, need to make sure your walkways are clear, accessible, and user-friendly to be protected, but your surveillance video recorder can show whether you’re at fault or not. Unfortunately, drug deals often take place in parking lots. Though you’re not responsible for catching illegal acts in the parking lot of your establishment, you could be of service to your local police department if you were to catch the act on your business security cameras in the parking lot. Is it time to beef up your business security in Moreno Valley or Southern California? Dutale Inc. is here for you. We offer LTS security camera systems and other camera systems that can make all the difference in your company’s productivity and protection. Contact us today for a free quote.